It’s not been a particularly great start to the year, has it? Floods in Australia, Japan’s tsunami, uprisings in the Middle East and the continued economic malaise have dominated the news and our thoughts during this early part of 2011. So, what did I do to alleviate the gloom? Well, obviously, I’ve been reading a novel featuring poverty, death, starvation, imprisonment, civil war and oodles of general misery. On the surface, this probably wasn’t such a good idea yet it has left me feeling strangely uplifted. The Life and Times of Michael K is set in 1970s apartheid-era South Africa. It’s titular hero is a man, born with a hare lip, who sets out on a journey to take his dying mother back to the place where she says she was born. She dies during the journey but Michael continues, taking her ashes back to be scattered at a now abandoned farm where she may or may not have been brought up. Once he has done this, Michael, now alone in the world, wants nothing more than to live free and undisturbed by the world. The world, however, has other ideas. On one level, this is a parable of the corrosive effects of apartheid on freedom. Not once is any character’s colour described yet we are in no doubt that Michael is black. Authority figures are continually seeking to restrict his freedom, from his mother who places him in a children’s home to Visagie, the army deserter who seeks to make Michael his servant, to the police who capture him and put him in an internment camp. Even the kindly medical officer at the rehabilitation camp in which he is held wants Michael to adapt to a more conventional behaviour pattern and to rejoin society. Yet Coetzee’s lament for lost freedom extends to the white characters in the novel. The medical officer who cares for Michael comes to view him as he is, a man seeking to live an undisturbed life, a life in which he leaves no trace behind him. He slowly comes to believe that he too is a prisoner of the system in which he works and fantasises about following Michael in his journey. On a more general level, Coetzee describes how difficult true individual freedom is to achieve in modern societies where there is constant pressure to participate and to conform. Michael wants nothing but to live alone and to eat only what he has grown in the earth. Yet society is constantly interfering with him, forcing him to work, to eat and to belong. Coetzee’s writing style is sparse and unemotional. He focuses on the concrete and the practical. He gives the reader descriptions of how Michael plants his pumpkin seeds and melons on the farm and how he builds his shelter. Almost paradoxically, this earthy way of writing creates in Michael K an unworldly, almost spiritual being. Michael is a man of few words (maybe because of his hare lip) and a man of little expression. His story is not one of resistance. It is a story of endurance. He rolls with the punches rather than fighting back. He acquiesces to the best of his ability in the demands of his captors. In the rehabilitation camp, he does not refuse the orders to exercise, despite his medical condition, but complies and runs and jumps until he collapses. Through all of his tribulations, he never gives up though. He carries on to return his mother’s ashes to the Visagie farm and he continues to return their after his captures. Other reviewers have seen themes relating to the value of life and the use of time in the book but, for me, the central element of the book is Michael’s seeking of purpose and freedom and the way in which he grows as a character as his quest progresses. If we need our heroes in literature to overcome obstacles and, in doing so, to grow in stature and depth, then Michael K, a simple man, is an extraordinary hero. Although, at the end of the book, Michael is physically back where he started in his mother’s old box room in the Cape, he is a very different man. He has found his purpose. He has found himself and he has found a dignified peace for himself. If you want me to pick holes or quibble about the book, I found the section written from the medical officer’s point of view to be a bit heavy-handed in explanation and it didn’t knit with the rest of the book very well. This would be a minor quibble, however. 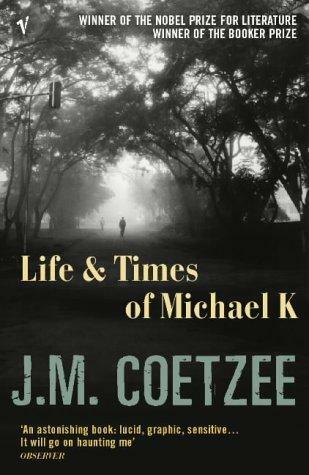 Coetzee won the Booker Prize for The Life and Times of Michael K and was awarded the 2003 Nobel Prize for Literature. Having now read this book, I can easily see why. It is not a light read but Michael K will live with me for a long, long time and I think that says a lot. Did you know that you can shorten your long urls with Shortest and make cash for every click on your shortened urls.